There have been a number of social, political and economic shifts that have played a major role in constraining, enriching, mediating and altering everyday family interactions and family practices. These include globalization, economic instability, neoliberal government paradigms, a culture of consumerism, technological advancements, shifting demographics and changing parenting ideologies. 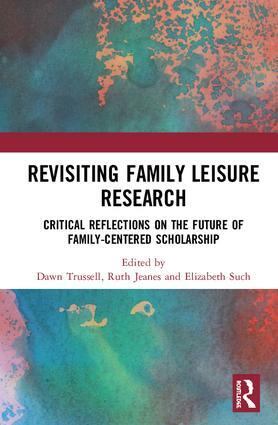 This book considers what advancements have been made in family leisure research over the past two decades within the context of a rapidly shifting society and examines potential new directions for scholarship. The book begins with an emphasis on the need for scholarship that explores diverse constructions of family and provides a call to action for family-centered scholars to engage with broader social issues. A collection of authors argue the importance of expanding the understanding of family to include older adults, highlight the missing perspectives of recreation and leisure agencies in family scholarship, and examine the ways in which information communication technology may alter family leisure. Authors also consider the dominance of particular theoretical perspectives, and the limitations and consequences of such perspectives, to understand the complexity, diversity and richness of the lived family experience. The chapters in this book were originally published in a special issue of Leisure Sciences and an invited commentary in the Annals of Leisure Research. "It must be acknowledged that the book has the valuable aim of displaying several perspectives on family leisure research by an aggregate version. Recognizing the gaps presented by authors in their excursus, as well as the progress done by the research ?eld so far, the book may provide a basic and up-to-date source for deepening the knowledge on family leisure and its multiple facets." Lucia Cicero, Polytechnic Department of Engineering and Architecture, University of Udine. Dawn E. Trussell is an Associate Professor in the Faculty of Applied Health Sciences at Brock University, Canada. The Social Science and Humanities Research Council of Canada has funded her research. She has written in the areas of family leisure, youth sport and transition to motherhood through a social justice lens. She is currently Vice President for the Canadian Association for Leisure Studies. Ruth Jeanes is a Senior Lecturer in the Faculty of Education at Monash University, Australia. Her research focuses on the relationship between sport and social exclusion/inclusion. She has written in the areas of family leisure, with a particular focus on children’s voice and the mediating impact of gender, disability and culture on young people’s involvement in sport. She is currently president of the Australia and New Zealand Leisure Studies Association. Elizabeth Such is a Research Fellow at the School of Health and Related Research, University of Sheffield, UK. Her research focuses on issues of health and social equity, and includes projects on leisure, physical activity, family life and marginalized populations. She served for many years on the Leisure Studies Association executive.